Hi, we’re Heather Gilion & Holly Snell. Nice to meet you. We co-authored the book, Dancing On My Ashes. We are sisters that like to write as a way of loving on our God and working through all of our thinking thoughts. I’m ordinary. The only reason you are reading this right now is because God did something extraordinary in this normal, most common girl. I thought I knew Him, but it wasn’t until what mattered to me most was ripped from my firm grip that I encountered the God of the Bible. 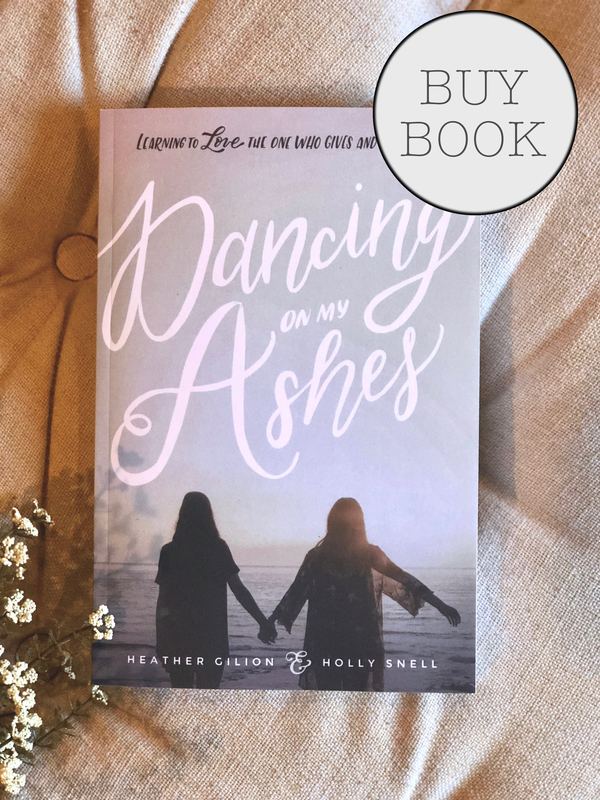 My sister Holly and I wrote a book called, Dancing On My Ashes: learning to love the One who gives and takes away. (You can go here to read more about what the book’s about: Dancing On My Ashes.) It is our story and a compilation of lessons learned through our desperate search for truth after the loss of our husbands. For me personally, I found something more precious than life itself, I found Him. I am ridiculously blessed. I am loved. I am a friend. I am a mother. I am a wife. But most importantly I am free. God has chosen to use this ordinary life for His extraordinary pleasure. I couldn’t be more grateful for the breath in my lungs to continue bragging on the God that I love so dearly. This blog is part of my mission to pay it forward! For when you experience grace that makes you pure and a freedom from the chains that once held you captive… you can’t NOT share it. So, good news and truth will be the focus for this blog. Heather is married to her best friend, Dallas. They have two wild boys they are wild about, Noah and Zachariah. They reside in Ozark, Missouri, where they serve at LifePoint Church. Heather feels called to write, speak, lead worship, and paint Scripture all out of the overflow of a heart in love with Jesus. Check out her art ministry: Story Designs by Heather Gilion. Choices. We are faced with choices everyday. Some decisions are easy and seem almost natural. Other choices take strong contemplation and will. My choice to follow and serve our beautiful God has not always been an easy journey, but I’ve learned in the darkest moments of my life, in making the conscious choice to RUN after Him, it’s there I’ve found the greatest joy and fulfillment despite my circumstances. I look forward to blogging snippits of what God is teaching me. A testimony is a powerful tool! Heather and I have been traveling around sharing our story, but also calling others to choose each day to actively remember God’s faithfulness. So no matter what comes we can trust He will be faithful! The start of this blog is just another way we live with Him on the forefront of our minds. Holly Snell is a speaker and worship leader at The Parks Church in McKinney, TX, where her husband serves as a Pastor. Holly serves as the Executive Director of Hope Women’s Center, an unplanned pregnancy clinic. Holly and her husband, Aaron, have three children; Emma, Malachi, and Ava. FOLLOW DANCING ON MY ASHES ON FACEBOOK! So ready to hear your story at First Baptist Pea Ridge! Thank you so much for sharing your story with us!